The "Deuce" Brush 37-2 is equipped with a deep water kit, a 400-gallon water tank with two booster reels and can pump 250 gpm (gallons per minute). It also has a 10-gallon foam tank. 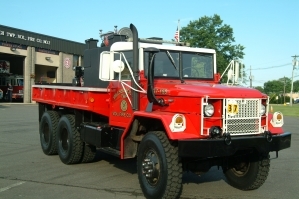 The Deuce is used for traffic control at accident scenes, deep-seated brush fires and can be used for water rescue capabilities. The Duce also carries miscellaneous hand tools for forestry firefighting and winch.